On Thursday 11 April the Jan van Eyck Academie will host the filmmaker Fabrizio Terranova. His film ‘Donna Haraway: Story Telling for Earthly Survival’ will be screened at 18.30 in the auditorium, and afterwards curator and researcher Daniel Blanga Gubbay will talk to Fabrizio Terranova about the film and his practice. The Jan van Eyck Academie would like to invite you to join the screening and the discussion! 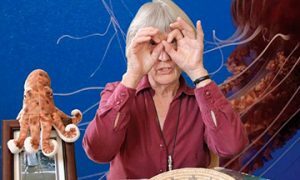 Filmmaker Fabrizio Terranova visited feminist and sociologist Donna Haraway at her home in California, living with her – almost literally, for a few weeks, and there he produced a quirky film portrait. Terranova allowed Haraway to speak in her own environment, using attractive staging that emphasised the playful, cerebral sensitivity of the scientist. The result is a rare, candid, intellectual portrait of a highly original thinker. Haraway’s words and discourses about the artificial construction of nature inevitably exceed and echo beyond the frame of the screen.